John Constable is an English painter who showed the world the first among artists that beauty is in native landscapes. He was not looking for a multiplicity of subjects. Constable’s first work did not arouse admiration among his entourage, but after years his work began to be perceived with great enthusiasm. The picture is painted in oil on canvas. This is one of his early paintings. Despite his youth, the canvas shows a masterful performance. Only two colors, blue and gray, with their many shades, show clouds in the sky as if moving. It depicts Wivenhow Park on a typical summer day. The ability to transmit an instant, the light and air environment is amazing. The picture is filled with serenity, serenity. Constable admired native spaces. On the right side of the picture is a boat in which two boys are depicted inviting beautiful swans to themselves. Cows graze on the hillock. The artist masterfully transferred their actions to the canvas. Constable’s strength is that he could perfectly group the characters involved in their daily activities. Quiet smooth surface of the river is moving under the influence of a light breeze. The left part shows a simple bridge over the river. The picture has an abundance of greenery, but each tree has its own unique texture and color. 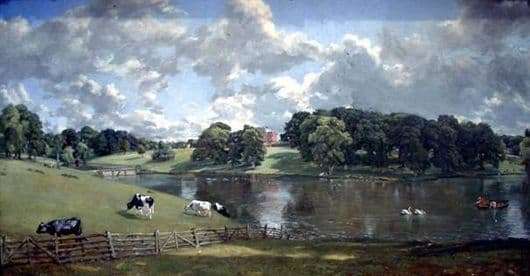 The foreground is filled with the cool shade of the trees under which Constable painted this landscape. In the background is a house that makes you dream about the people living there. The artist depicted the realistic rustic look of his native places; in them he saw an endless source of beauty. Pictures of the constable depict what he saw before his eyes. All work is realistic, the artist did not put into account the composition. Simplicity is pacifying. Thanks to Constable’s landscapes, we can know exactly how people lived in the countryside in the early 19th century.